For Apple TV 4 users, you can experience the best possible sound quality by connecting your Apple TV 4 and your 1080p TV produced by Sony, Toshiba and Vizio models to a audio receiver that supports LPCM (uncompressed or lossless audio formats) or Dolby Digital (compressed multichannel audio formats, including 7.1 and 5.1) audio. The following article will show you how to play movies using Apple TV 4 on 1080p TV with Dolby Digital 5.1 Surround sound. What’s needed to get the job done? How to get 5.1 surround sound? 5.1 is the industry standard and is used by most DVD and Blu-ray disks, as well as by HDTV and video games. It is also the most common sound system in commercial theaters. How to connect Apple TV 4 and 1080p TV to 5.1 surround sound system? Step 1: Connect your Apple TV 4 to the 5.1 sound receiver. Step 2: Select the Apple TV on the home theater receiver. Step 3: Check the Dolby Digital setting on the Apple TV 4. Step 4: Confirm Dolby Digital setting is enabled on the receiver. For detailed step by step guide information, please visit: connect Apple TV to Surround Sound System. 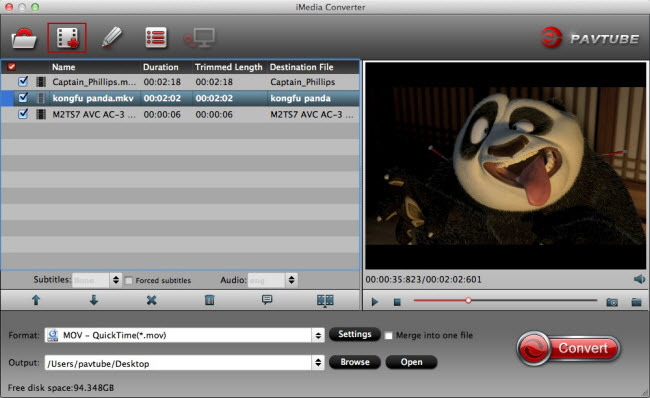 Here, a beneficial program called Pavtube iMedia Converter for Mac (review) is highly recommended, the program has full support for all media types including commercial Blu-ray and DVD disc and also digital video with virtually any file formats. The biggest merits of this program is that it enables you to directly rip convert Blu-ray/DVD/Video to Apple TV 3/4 1080p Dolby Digital Pass-through(*.m4v)” format, a file format that Apple TV 4 can directly pass through to the 5.1 Sound Receiver. You can then get the best sound quality when playing any movies with Apple TV on 1080p TV with connected 5.1 Surround Sound System. The aspect ratio of your DVD or digital video may uses an aspect ratio that doesn’t match your 1080p TV, you can easily select and change the output video aspect ratio to let them fit with your 1080p TV in the program’s “Crop” window. 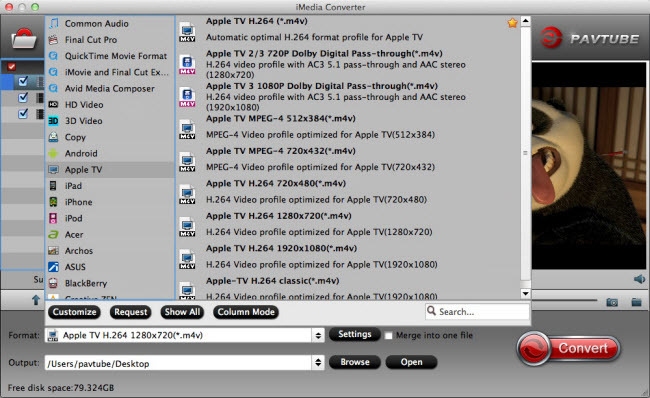 Pavtube iMedia for Mac for Mac is quire simple to use, anyone can learn to use it in minutes. It has perfect compatibility with the new macOS Sierra 10.12, Mac OS X El Capitan 10.11, Mac OS X 10.10 Yosemite, Mac OS X El 10.9 Mavericks, etc. The results produced by the program are pretty high quality, you can’t tell the difference between the result video and the original Blu-ray/DVD/video. How to Convert Blu-ray/DVD/Video to Apple TV 4 Dolby Digital Pass-through Format? 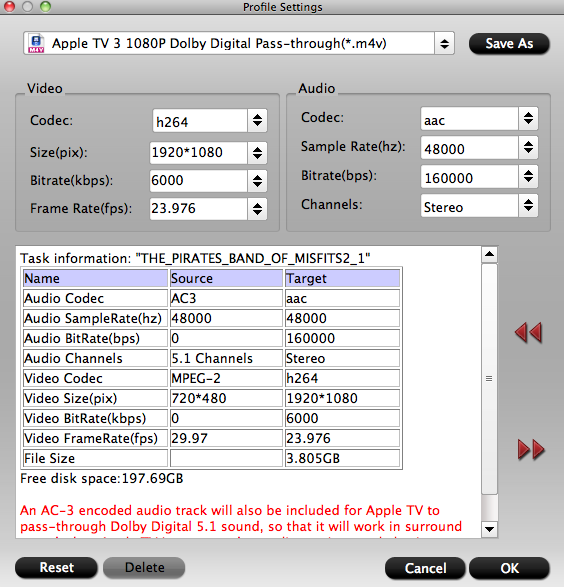 Clicking the Format bar, from its drop-down list, select “Apple TV 3 1080P Dolby Digital Pass-through (*.m4v).” under “Apple TV” main category as the target format for Apple TV 4 pass through the 5.1 sound to your audio receiver. Step 3: Change output video aspect ratio. If you want to keep the cropped aspect ratio, there are several aspect ratios for you to choose from, including 16:10, 16:9, 5:4, 4:3, 3:2, and 2:1. Once you select your 1080p TV compatible “Display aspect ratio”, the “green crop frame” will keep this ratio to crop video and you are able to preview the final effect in real time. If you want to keep the same aspect ratio in your final output files, do remember to set the Video “Size (pix)” in “Settings” section as the same ratio as display aspect ratio. After all setting is completed, hit the “Convert” button at the right bottom of the main interface to begin the conversion process from Blu-ray/DVD/video to Apple TV 4 Dolby Digital Pass-through format. When the conversion is finished, click “Open Output Folder” icon on the main interface to open the folder with generated files. Then feel free to following the steps listed above to connect Apple TV 4 and 1080p TV to your 5.1 surround sound system for getting the best 5.1 surround sound quality. How to Play Netflix movies on Apple TV 4?